Hebburn Town and Jarrow have both been handed away ties to start their Buildbase FA Vase ambitions for the coming season. The Hornets will travel to Bradford side Eccleshill United in the first round qualifying on Saturday, September 1, while Jarrow face a much shorter trip to Northern League rivals Whickham. The winners of the Eccleshill-Hebburn tie will be at home in the second round qualifying, against Billingham Synthonia or Knaresborough Town. Whickham or Jarrow will entertain Esh Winning or Whitley Bay. Meanwhile, in the Emirates FA Cup, Hebburn have been given a home game against Northern League First Division side Dunston UTS, a tie to be played on August 11, the second weekend of the new season. The winners will host Yorkshire outfit Pontefract Collieries in the preliminary round on August 25. South Shields, preparing for life in the Evo-Stik League Premier Division, are exempt until the first round qualifying on September 8. The Mariners are also exempt in the Buildbase FA Trophy until the first round qualifying in November. 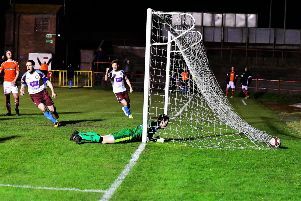 Hebburn Town and South Shields have both landed away ties in the FA Youth Cup’s preliminary round in early September. Hebburn must travel west to take on Workington, while Shields go down the A19 to visit Stockton Town. Workington or Hebburn will entertain Carlisle City in the first round qualifying, while Stockton or Shields will play host to Spennymoor Town.